BBy 2012 the world should see all chemical warfare agents disposed of in an environmentally-compatible manner. A plant has been erected in Pochep, which is roughly 500 km south west of Moscow, to deal specifically with the clean disposal of 7,500t Vx, sarin and soman. The plant was commissioned by the Russian Federation, with financing borne by the German Foreign Ministry. Contractor: the EISENMANN company based in Böblingen, Germany, specialist for surface, environment and special process engineering. Two separate lines, each with a capacity of 1,000 kg/h were installed to burn the liquids at approx. 1,200 °C. 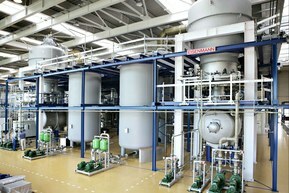 The first line has two high-turbulence reactors, which each have flue gas treatment equipment with quenches, washer and filter equipment installed downstream. The second line is for burning solid materials. For example contaminated protective clothing, packaging as well as activated carbon and aluminium oxide from the waste air purification. Ammunition bodies are also annealed here before being cut up. To ensure the required sewage-free operation, a multi-level sewage treatment plant with vaporiser was included in the plan. There can be no malfunctions in a plant as sensitive as this. That is why EISENMANN has played it safe: ÖLFLEX® CLASSIC 110 connection and control cables as well as the EMC-compatible CY alternatives connect the motors of the pumps, ventilators, drives, magnetic valves and sensors to the control room. ÖLFLEX® FD CLASSIC 810 were used in the conveyor systems for cleaning and cutting up the emptied ammunition bodies. Moreover, UNITRONIC® BUS data cables in the central control system relay the orders to the ancillary plants quickly and without interference. Close to 2,200 employees develop new technologies and facilities for production, assembly and distribution. Engineers, technicians and specialists from various disciplines handle the planning, design, construction and startup operation of the most advanced systems, including maintenance and system operation. football pitch. The interaction between pumps, fans, drives and sensors requires precise coordination in such a highly sensitive system.